Nissan gets so much right in launching new cars that it can be excused the occasional swing and a miss. The Murano, the Cube and the car we look at here, the Pixo citycar, all failed to significantly excite the British public. As we've seen with many such models however, what can make an underwhelming new car can often make a good used buy. A lack of market recognition, oversupply of rival models or just buyers relying on outdated perceptions can mean that perfectly good cars can become forgotten about and therefore make excellent used bargains. Does the neglected Pixo fit that bill? Read on to find out. Nissan's introduction of the Pixo was a timely piece of opportunism, or so it seemed. The Government had announced draft plans for the Vehicle Scrappage Scheme in 2008 and Nissan realised that with no citycar contender to pitch in beneath the Micra and the Note, it might well lose out in the sudden bonanza of buyers with a few grand in their back pockets looking to score something cheap and new. The 'new' part of the Pixo was open to a bit of debate. The car had been on sale in other markets badged as the Suzuki Alto, and was built very inexpensively in the Maruti-Suzuki plant in India. 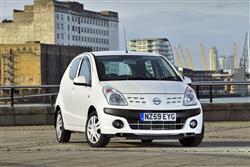 A revised front grille, headlights and branding and Nissan had an instant citycar contender. The problem was, it was neither as good nor as affordable as the Kia Picanto or the Hyundai i10, the two cars that are regarded as the biggest beneficiaries of the Scrappage Scheme. The Pixo enjoyed a few revisions in summer 2012, with fresh exterior colours, an improved interior and, crucially for tax and toll savings, a drop in CO2 emissions to 99g/km, before being quietly deleted in 2013. Despite its diminutive dimensions, the five-door Pixo strikes a decent balance between compact design and practicality. There's space inside for four adults and their luggage as long as they pack very light. With the rear seats in place, load space is 129-litres. When it was first introduced, three trim grades were offered - Visia, Acenta and Tekna. The Visia undercut its Suzuki Alto sister car with its £6,995 price tag but that was still £1,000 more than you could grab a Kia Picanto for. It came complete with ABS brakes with EBD and twin front airbags. Buyers also get power steering, CD player with MP3 playback, front cup holders and rear wash/wipe. Step up a grade and a modest £750 premium netted you the Acenta, which was the best seller. Also available with a four-speed automatic transmission, the Acenta's kit list included side airbags, remote central locking, electric front windows, front fog lamps, colour-coded mirrors, plus door handles and the convenience of a 50/50 split folding rear seat. Topping the trim choice trio was the Tekna. Here you got air conditioning with pollen filter, ESP and curtain airbags. The key issue to bear in mind when shopping for a Pixo is that it's a car built cheaply in India. On the one hand, that means that it's rugged enough to survive almost anything that will be thrown at it, the three-pot engine being capable of sustaining quite astonishing abuse, but there is a flipside. Such developing markets just aren't as interested in the kind of build quality and belt and braces safety features that sell to European buyers. Safety equipment is adequate for a car this size, although the entry-level Visia model only has two front airbags - you need to opt for an Acenta to get side airbags. The top Tekna model gets curtain airbags as well as an electronic stability programme (ESP). The largely identical Suzuki Alto registered a three star Euro NCAP rating which also applied here. The interior looks - and is - cheap but the hard plastics can shrug off the sort of rubbing and scraping with feet and bags that would have more expensive interiors looking very tired. Like an old Timex, the Pixo can take a licking and keep on ticking. (approx values for a 2011 Pixo Visia) Parts are extremely affordable for a 'Japanese' car. A clutch assembly will be around £125 and front brake pads are around £35, while rears go for around £40. An alternator should be close to £135 and a radiator around £115. The advantage in having a car that weighs about as much as your average Texan's entree is that 68bhp actually does a pretty good job of punting it about. While the Pixo is never going to feature in many 'Driver's Car of The Year' shootouts, there's a good honest fun about it. The steering is well-weighted, the manual gearbox and pedal positioning isn't at all bad and the body control enables you to get some jollies in corners. While the ride might feel a bit abrupt on city streets, all told it's quite an accomplished little package. The three-cylinder engine does its best work between 2,000 and 4,00rpm and that 850kg kerb weight means that pulling away into traffic isn't as hair raising as you might expect. Unless you've got three Texans on board, in which case it'll be utterly terrifying. The automatic transmission takes the hassle out of traffic crawls but is rather dull-witted when the car's on the move, removing a lot of the Pixo's cheeky fun factor. 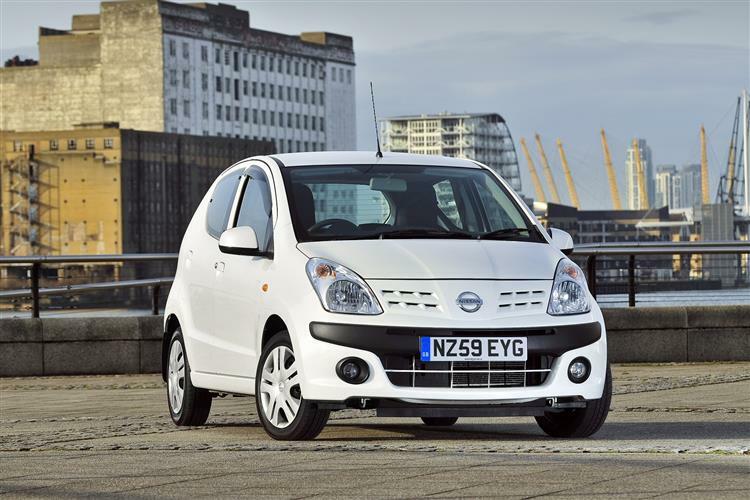 The Nissan Pixo emerges as one of those models that's a better buy used than new. While it's certainly not a great car, the Pixo does have one thing in its favour. In an age when even small cars can feel stodgy and dull, it's a hoot to drive. Buy one, drive it like a holiday rental and rest assured that little will go wrong. There's nothing wrong with that formula.